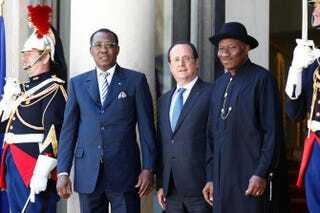 Chadian President Idriss Deby (second from left), French President Francois Hollande (third from left) and Nigerian President Goodluck Jonathan (right) before an African security summit on May 17, 2014, at the Élysée Palace in Paris. U.S. troops have been sent to the Republic of Chad in an increased effort to locate the more than 200 missing Nigerian schoolgirls who were abducted in the middle of April, the White House announced Wednesday, according to the Washington Post. According to the report, 80 troops have been dispatched, displaying bolstered U.S efforts to “support the operation of intelligence, surveillance and reconnaissance aircraft for missions over northern Nigeria and the surrounding area,” according to the statement given from the White House. Before this movement, the U.S. already had sent a team of military, law enforcement officials and hostage negotiators to help the Nigerian government—in an “advisory” status only—locate the girls who were kidnapped by terrorist cell Boko Haram.